Constructed in the same traditions as a Spanish guitar, this tenor uke is lightweight but built to last. 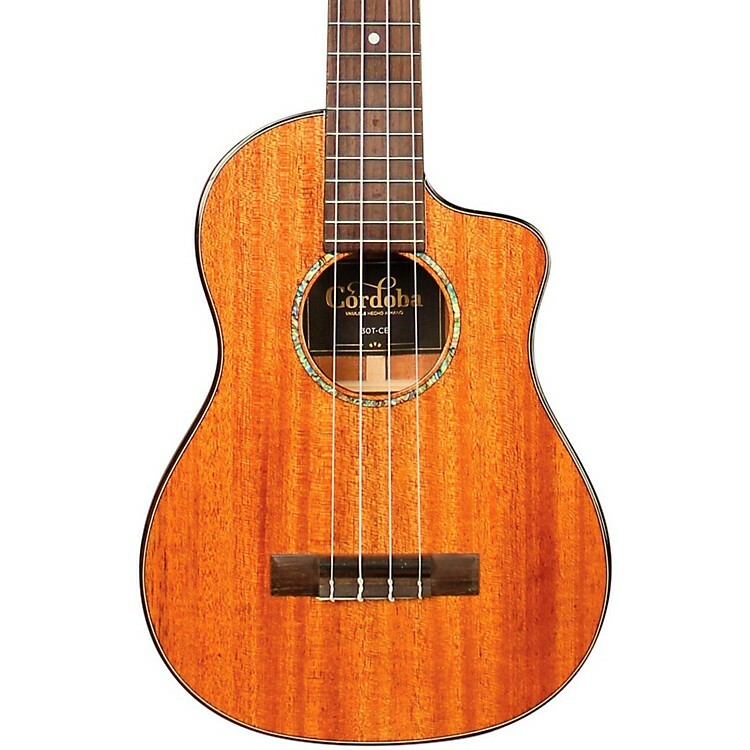 The 30T-CE tenor uke is an extremely lightweight instrument that features the classic combination of a solid mahogany top, back and sides, giving it a warm and balanced sound. It features a soft cutaway and the L.R. Baggs Five.O pickup, a small, lightweight pickup specifically engineered for the ukulele's unique size and voice. It also has a beautiful rosewood bridge, binding, and fingerboard. The styling is refined and sleek, using abalone for the inlaid rosette and rosewood for the binding, capped off with Cordoba's signature elevated headstock with a figured acacia overlay. The finish is a hand-rubbed polyurethane, applied as thin as possible for maximum resonance. Other features include a black TUSQ nut and saddle, chrome Grover tuners, and a Cordoba polyfoam case. The 30T-CE is the first of Cordoba's 30 Series, a premium line of boutique, all-solid tenor ukuleles approached from a classical or Spanish guitar-building perspective. Most notably, Cordoba is using an integrated neck joint or "Spanish Heel" instead of a traditional dovetail joint to join the body and neck of the ukulele. This method of construction offers a lighter weight and more stable heel joint that increases resonance and is less prone to movement as the ukulele ages. Cordoba collaborated with renowned luthier Pepe Romero Jr. on the 30 Series, adopting Romero's vision of building ukuleles as if they are small guitars using traditional Spanish building methods. The result is an incredibly lightweight tenor ukulele with a deeper and wider body, featuring a Spanish heel neck joint, fan bracing, and a wider fingerboard for easy playability. Just like your playing will get better with age, so will this uke. Order today!